Taking water from the ground to the point of use. 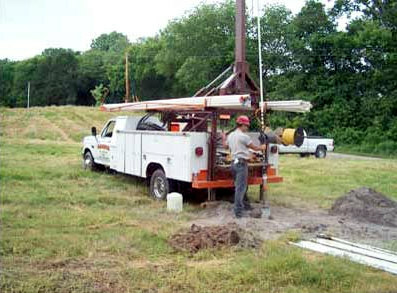 Watson Company can design and install your water well pumping system. Pumps must be installed and serviced by licensed installers. It is not a job that any person should do without proper training and experience, and certification. We have a large number of pumps and related supplies in our warehouse to serve your immediate needs. Our service trucks are well stocked so when we get to your property we are prepared to handle any unknown situation. All trucks are modern, clean, and equipped with telephone communication with our office. Our warranty on products and services is the best in the industry. All records of installation and service are kept on file for future reference. We are qualified to complete the installation from the well to the house, this includes trenching, plumbing and wiring. The efficiency of a water supply system depends almost entirely upon proper selection and installation of the well pumping system. To select the proper pump for an installation, it is necessary to know the well conditions and the discharge capacity and pressure required. Facts that need to be known when sizing a pumping system are, well depth, static or standing water level, draw down water levels or pumping levels, and the estimated yield in gallons per minute. At what depth the water bearing aquifer was encountered is also very important as well as the distance to the point of use from the well and surface elevations between the well and point of use. Submersible pumps are the most frequently used pumps because they deliver greater volumes of water and pressures that are required to meet the needs for residential, commercial, industrial and irrigation applications. A submersible pump is an entire pump assembly including the electric motor. They are made of stainless steel and brass. The pump is submerged under the water level in the well; the water is delivered by pushing the water out of the well through a pipe that is attached to the pump. The motor is attached onto the bottom of the pump, and is powered by electricity, usually 230 volts, by a wire that is attached to the pump motor from the surface and attached to the pump pipe in the well by strapping every 10 to 20 feet. Submersible pumps are the most reliable and trouble free pumps that will provide an abundant supply of water. They are very efficient, and if installed properly will last 10 to 15 years or longer. A lot depends on the well conditions and the way the pump is used. One of the most aggravating experiences dealing with water is not having enough pressure. This can be experienced through several different ways. Showering, laundry, irrigation, washing a vehicle, or just plain old playing in the water. This can easily be corrected by installation of a booster pumping system. The pressure can be boosted to 60 or 70 pounds. This application can also be used on municipal water systems as well as private systems. Most pumps in today’s installations are submersible pumps. These are pumps that have the motor attached to the pump and are lowered into the well attached to a drop pipe. The pipe attached to the pump is usually PVC, or galvanized steel. The pump is powered by electricity, usually 230 volts. There is a pump wire from the power source to the pump. 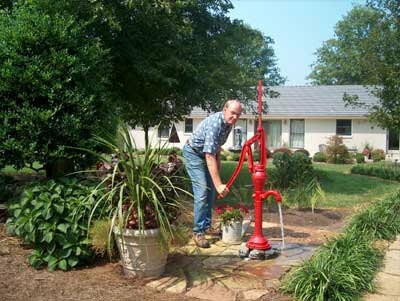 Properly sized with quality material the pump will give excellent water pressure with dependability. The pump can be installed on a pitless adapter. You can depend on pumps engineered and installed by Watson Company to provide you with years of dependability, and excellent water pressure. When it comes to questions concerning application, installation or service we go the to the fullest to deliver useful information. Pump selection can be made easy with our computer design program. The result is a pump application that will deliver maximum operating efficiencies for your specific application. Our highly trained pump experts know how to provide solutions to even the most challenging problems. Customers have access to this information when calling our company. Our service people are trained in all aspects of pump application and problem solving. They arrive well groomed and dressed in company uniforms. Our service vehicles are clean and well stocked with pumps and supplies. Our warehouse is stocked with inventory that meets most any applications, from residential, irrigation needs, to commercial requirements. When you’re ready to install a new or replacement pump in your water system, call Watson Company Inc. They have been installing and repairing pump systems for over 40 years.